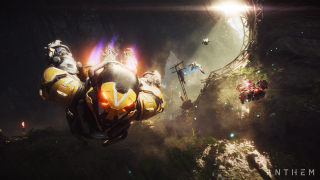 After Anthem's rocky VIP demo, BioWare says the next "should go much more smoothly"
Between connectivity issues and endless loading screens, the recent Anthem game VIP demo was a bit of a slog. In a blog post recapping the demo's events, BioWare's Chad Robertson assured players that the studio is working to smooth out those issues ahead of the open demo this weekend and the game's launch later in February. We also spoke to BioWare general manager Casey Hudson to get a better understanding of what happened during the VIP demo and to discuss how the final game will avoid the same potholes. "It was definitely an interesting weekend for us," Hudson said. "Fortunately, the things that we encountered were really probably specific to this particular weekend and the way that the entitlements worked, in terms of VIP codes and friend entitlements and things like that. And the other piece of it was, it wasn't a server capacity issue so much as just a problem that we couldn't test until we had this many people trying to get in. It was literally the side effect of the number of people trying to get in at the beginning, causing problems for access and taking servers down in an unexpected way. Fortunately, those aren't intrinsic to the game itself. We have some fixes for those things next weekend. It was only something that was specific to this weekend anyway, so it wouldn't show up." Hudson said as much on Twitter when the VIP demo first started to buckle. It's encouraging to hear that the problem wasn't necessarily how many players were trying to play Anthem, as the upcoming open demo will surely see many more players. According to Hudson, the final game - which is a newer build than the one used for the demo - will also benefit from adjustments made following the VIP demo. "Then we had a couple other things that were already fixed in the main game, because this code that we use for the VIP demo weekend is actually quite a bit older than the final code for the game that will be coming out. Because we've built it to be a game that can receive constant improvements and updates, some of the things we're seeing this weekend are fixes that we're able to build in for next weekend and the final game. We think next weekend should go a lot more smoothly. And then the launch version, that is quite a different thing, too, because that already had some of the fixes that would have helped for this weekend - a few other things we've learned along the way." Hudson's statements line up with a new blog post from Robertson, which again affirms that "you should see significant improvement in multiple areas over last week." Robertson added that it's still entirely possible "we may see recurring and new issues," but even in that worst-case scenario, they should be dealt with more smoothly this time around. "Our ongoing scale testing this week has gone well," Robertson said. "We’re confident we are ready for the load we will see. Like last weekend, we will be prepared with more server capacity than we anticipate will be needed. However, predicting player numbers – particularly for a new game like Anthem in its first open public weekend – is very difficult. If more players decide to try the game than we anticipate, we also have systems in place to control entry rates of incoming players. This is to ensure players in the game are having uninterrupted fun and to give us time to increase capacity." At this point, day-one server issues really should be expected from big online games, but that doesn't make them any less frustrating. I think part of the problem was the mixed message regarding Anthem's VIP demo; it felt like a stress test but it was marketed like a demo. I have to wonder if things wouldn't have gone better if BioWare had held an external stress test before all this demo stuff. Anyway, here's hoping Anthem's open demo and launch go off without a hitch. We'll be covering Anthem extensively for the next two weeks in our new editorial series On The Radar: Anthem.